All rug types including wool, silk, sisal, sea grass, synthetic, sheepskin, oriental, Persian, etc. Extensive soil and expert spot removal. Three odor solutions including pet urine treatments. We do not soak rugs in washing machines or with hoses; no damage or color loss! Established family business with a local reputation since 1971. Friendly, efficient technicians and courteous customer service. We stand behind every job. We’re BBB accredited, bonded & insured. Keep reading to learn more about our cleaning method and our guarantee! Our proven 40+-year-old rug cleaning solution, Health+Clean, is unique among professional San Diego rug cleaners. We can clean almost all rugs on site, or at our location. This ability is almost unheard of in our industry, and it’s all due to our extraordinary method, Health+Clean. Health+Clean allows us to use just 10% moisture content in our our rug cleaning solutions instead of 100% moisture content. And we don’t soak rugs. No rug-sized washing machines. No hand wash rug cleaning procedures that necessitate spraying rugs with water. Why is this a good thing? Keep reading! Pressurized water exerts force on structural rug fibers and bends them back and forth, which can cause fiber splintering and color dulling. Read: it shortens rug lifespans. Mineral-containing water itself is abrasive. Tiny mineral gravel is dispersed among the rug’s fibers and just stepping on the rug in future can then cause nicks and cuts in rug fibers. These two factors combined in traditional water washing by area rug cleaners san diego can cause accelerated fading and wear but it’s noteworthy to point out that rug water washing is simply not necessary for effective soil removal. Customizing our PH-balanced cleaning solutions to your rug type. Three progressively more intense odor solutions for pet accidents, urine and other other tough odors! We have an additional rug 100% dry rug cleaning method that services certain rugs that cannot tolerate any moisture. We are a one-stop rug carpet rug cleaning service. We offer a wool rug cleaning service, a sisal rug cleaning service, a sea grass cleaning service, an antique oriental cleaning service, a silk rug cleaning service among others. We offer high quality rug cleaning at your location or ours. You choose! No need to move heavy furniture off rugs, if desired. P.S. Look up our reviews on all the top review sites! The rugs were in need of cleaning. We had used a home cleaning machine about a year ago but it did not do a very satisfactory job. Tony’s two employees moved furniture as needed, vacuumed, spot cleaned, cleaned, and protected the rugs. They returned the furniture and put pieces of plastic under the furniture legs. The rugs now look much better. The rugs no longer show any signs of dirt. … We are very pleased with the work that was performed. Hugh M.
This experience was a joy! The person answering the phone was efficient and professional. I was able to get an appointment the same day. The people cleaning the rug came exactly on time. They were pleasant, efficient, professional and answered all my questions. The rug looks great. The whole experience was the most painless household chore I’ve ever had to do. Thank you, Tony’s Best Way! Linda K.
Tony’s Best Way Cleaning is simply wonderful. …They were professional, quick and cleaned up after themselves nicely. They did NOT come in and soak my furniture or rugs with lots of solution or water. They used very little water and a unique cleaning machine to get the maximum, effective clean. 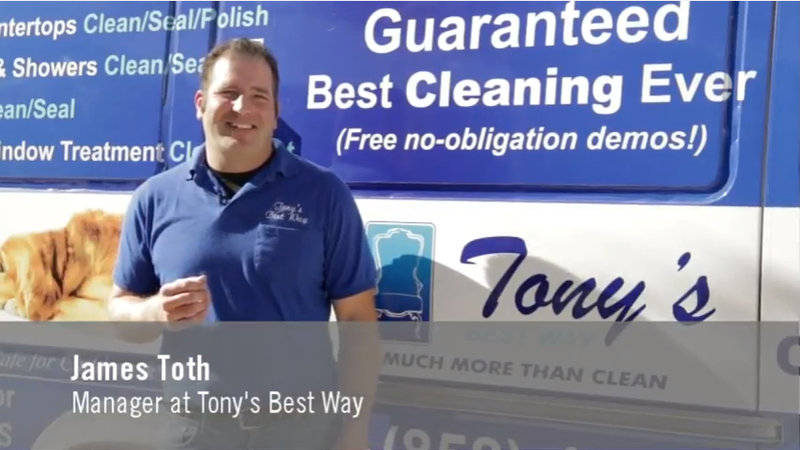 They were very knowledgeable on how to clean my wool rugs… My rugs look brand new… I would highly recommend Tony’s Best Way Cleaning for fast, friendly, professional, knowledgeable cleaning. Amy H.
People appreciate that our father and son business is not a homogenized franchise. We can tailor every aspect of your cleaning to your needs and do what it takes to get the job done right. Trust our family’s 45 year old tradition of Rug Cleaning San Diego excellence. Objective analytics are gold at predicting the performance of a service based company like ours. Trust our non-stop stream of repeat business and client-to-client referrals, our high-quality Yelp reviews, our four decades of business, our before and after pictures, and our BBB Reliability Report. Watch your own technicians at work in a local home!